Taos Mountain is our backyard. 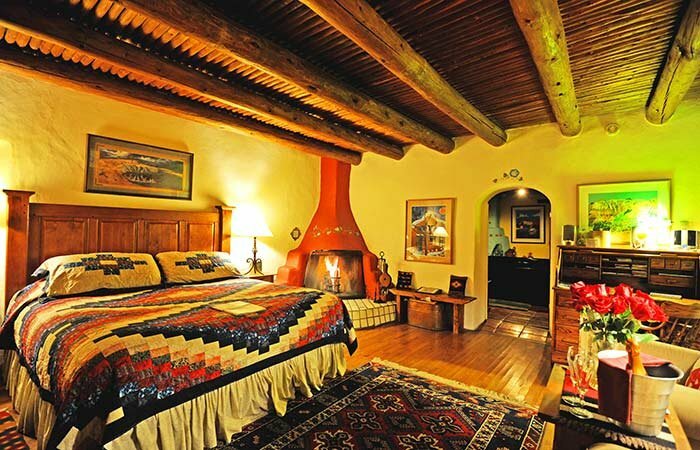 Taos Hacienda del Sol Historical Bed and Breakfast consists of three adobe buildings, with the original building dating back to 1804. Situated on 1.2 acres, the hacienda adjoins 95,000 acres of Taos Pueblo land with Taos Mountain, considered sacred by the Taos Indians, providing a commanding backdrop to our two lovely courtyards. Latilla fencing along with traditional adobe walls surround the beautifully landscaped grounds. To date, 600 daffodils, 2000 tulip bulbs, numerous fruit trees, shrubs and perrennials have been planted. Though Hacienda del Sol means "House of the Sun" in Spanish, towering cottonwoods, elms, willows and blue spruces shade our hacienda in the summertime. The courtyard behind the main house is ringed with old lilac bushes which fill the air with their fragrance every spring. Three large golden willows add a graceful aura of romance to our backyard, the setting for numerous summer weddings. We pamper you right from the start. 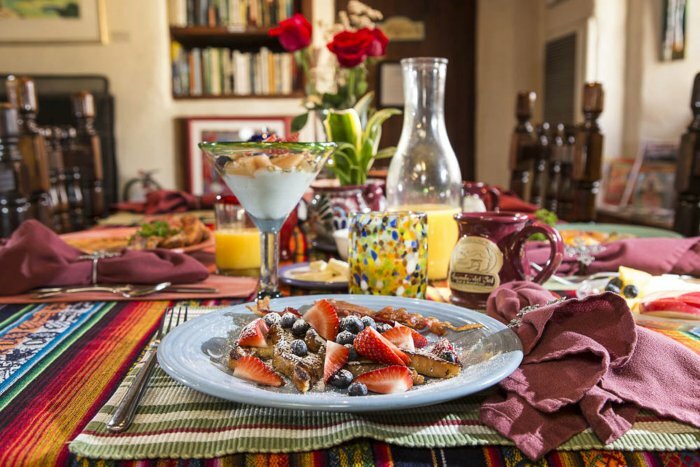 Our guests wake up to the aroma of our freshly-ground, special blend coffee in the air and a delicious breakfast available in the historic southwest dining room. Three dog friendly rooms ($25 non-refundable pet fee), please call for room details and "doggie rules"
Two beautiful courtyards with handcrafted tables and chairs, with the best views of Taos Mountain in town! Our history is as colorful as our gardens. 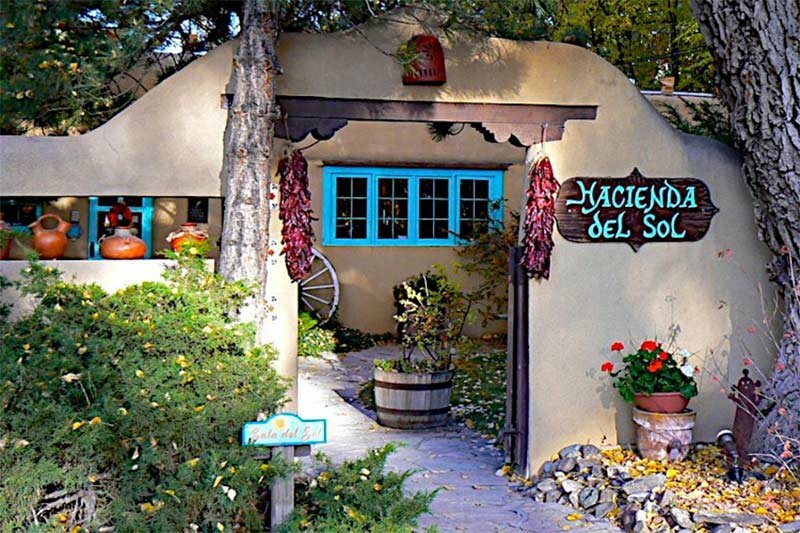 When you enter the front gates of the Taos Hacienda del Sol Bed and Breakfast, you are stepping into part of the artistic history of Taos itself. 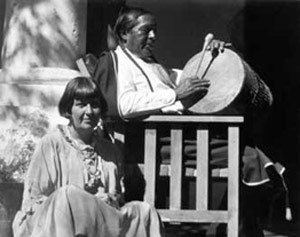 For many years the adobe was owned by Taos' legendary art patroness, Mabel Dodge Luhan and her fourth husband, Tony, from Taos Pueblo. In those days the hacienda consisted of a four-room adobe, an apple orchard and many acres of farmland and pastures. 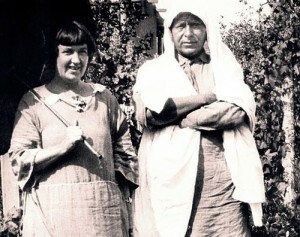 Mabel and Tony used the house as a temporary residence and for many years used it as a guest house for such notables as D.H. Lawrence, Georgia O'Keeffe and Willa Cather. 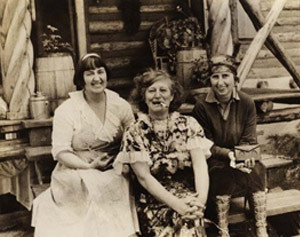 One of the Southwest's most respected authors, Frank Waters lived here in 1939 and it was during his stay here that Frank authored The People of the Valley as well as gathering the material for The Man Who Killed The Deer which he dedicated to Mabel and Tony. Tony Luhan was a Pueblo Indian. Located just two miles behind us is the Taos Pueblo, a UNESCO World Heritage site, and one of the most visited sites in New Mexico. The main part of the present buildings were constructed between 1000 and 1450 A.D. They appeared much as they do today when the first Spanish explorers arrived in Northern New Mexico in 1540 and believed that the Pueblo was one of the fabled golden cities of Cibola. Approximately 150 people live within the Pueblo full time and share their culture, handicrafts, and rich culture. Guided tours are available daily.